It is marvelous when the results speak for themselves. The smug feeling you get when you dig up plump, fat cloves of garlic each season is immense. On the downside, and I know this from personal experience, it can be rather gut wrenching when all that pops out of the ground is a miniature looking version of the first-sized cloves you are hoping for. Even though the mini versions taste the same, the fiddling about peeling tiny cloves of garlic doesn’t do it for me. Traditionally garlic is planted on and around the shortest day when the soils are at their coolest and harvested on the longest day. Full sun is mandatory, do not compromise on this. Whereas other members of the onion family will cope with only half a day’s sunlight, garlic does not really thrive. If sunny options in vegetable beds are limited, an alternative is to grow garlic in pots in a sunny position on the patio, deck or terrace. Garlic prefers not to be planted in the same spot each year, rotate beds annually. A successful crop of garlic starts and finishes in the root department. On the top of the ‘to do’ list is soil preparation. This may make some people yawn, but it’s vital. Work over the soil, to a depth of 20cm. At the time blend in blood and bone, sheep pellets and compost. All these goodies provide the necessary platform for the crop to thrive. In areas where the soil is saturated over the winter months, garlic can be planted in trays, ready for planting out in the spring. Ensure the trays are deep enough for the clove to be covered in soil and that there is enough room for the roots to form and develop. Only plant the largest clove segments, the smaller, middle pieces are rarely successful. 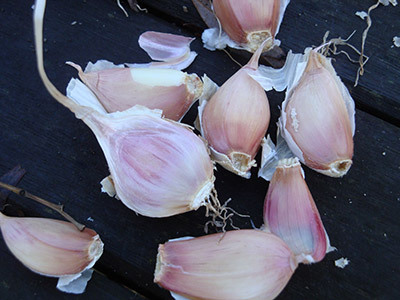 A good job for an evening in front of the fire is to split up garlic cloves ready for planting. Don’t worry about peeling off the paper husk, it provides insulation and eventually disintegrates once the clove begins to swell with moisture, put down its first roots and sends up its green shoots. Discard anything that looks blemished and small. 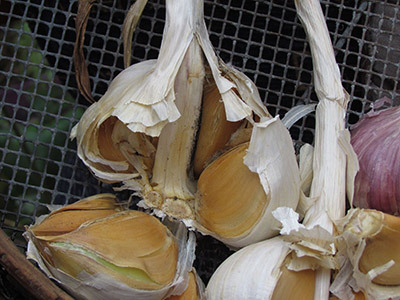 The cheapest way to grow garlic is to save your own seed, and that is all fine and dandy if you are already growing your own garlic but not so easy if you aren’t. If you are starting from scratch or want to boost your crop numbers always use certified garlic. spend a little time hunting down a good source of organic garlic. Garden shops stock seed in the winter months and a number of websites list and sell it as well including buy and sell websites. Farmers markets are a brilliant source for seed stock. A $20 garlic plait could yield you up to 100 cloves ready for planting. Avoid planting imported supermarket garlic. This product has been treated with a chemical to meet quarantine regulations that prevents the bulbs from sprouting. Garlic from the organic section of a supermarket will be fine to plant. Plant 10cm (finger depth) deep and 15cm apart. Allow 30cm between the rows, even though it is tempting to cram more in the beds. As the bulbs begin to fatten up and mature, they will compete with each other for space, nutrients and light. This can cause the plants to put on a lot more top growth, as they try to reach the sun, the results often mean a smaller clove at harvest time. A layer of mulch either side of the rows will benefit the crop and keep weeds at arms length. In winter, birds have to work a bit harder to forage for food, and the freshly dug over garlic beds can tempt hungry birds to scratch out your garlic. To avoid this cover with netting until the shoots appear in 6-8 weeks. Keep garlic well watered during dry weather in late spring and as the cloves are fattening up in early summer. If it’s dry for long periods, the cloves will not plump up and fully develop.